There's a new Swiss Mushroom Melt option on McDonald's Signature Crafted Recipes line in select areas across the country. It features seasoned, grilled mushrooms, two slices of Swiss cheese, and a creamy garlic and herb spread to go along with your choice of either a Quarter Pounder beef patty, Buttermilk Crispy Chicken filet, or Grilled Artisan Chicken filet, on a choice of either a artisan roll or sesame seed bun. The Swiss Mushroom Melt is one of several optional Signature Crafted Recipes that a McDonald's franchisee can elect to offer. The other two are Signature Sriracha (Sriracha Mac sauce, crisp onions, fresh baby spinach & kale, tomato, and processed white cheddar cheese) and Buffalo Bacon (Buffalo sauce, applewood-smoked bacon, shredded lettuce, and blue cheese sauce). 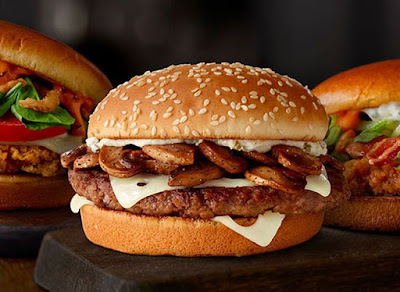 The combination of mushroom and Swiss cheese has found its way onto the McDonald's menu on several occasions in the past, including as an Angus Snack Wrap, as a Sirloin Third Pound Burger, and as a Quarter Pounder (all of which have since been discontinued).